Pidgeot in game: 1,515 Who? Important notice! Pokemon Pidgeot is a fictional character of humans. Pidgeot (Japanese: ????? Pigeot) is a dual-type Normal/Flying Pokémon. It evolves from Pidgeotto starting at level 36. It is the final form of Pidgey. It can Mega Evolve into Mega Pidgeot using the Pidgeotite. 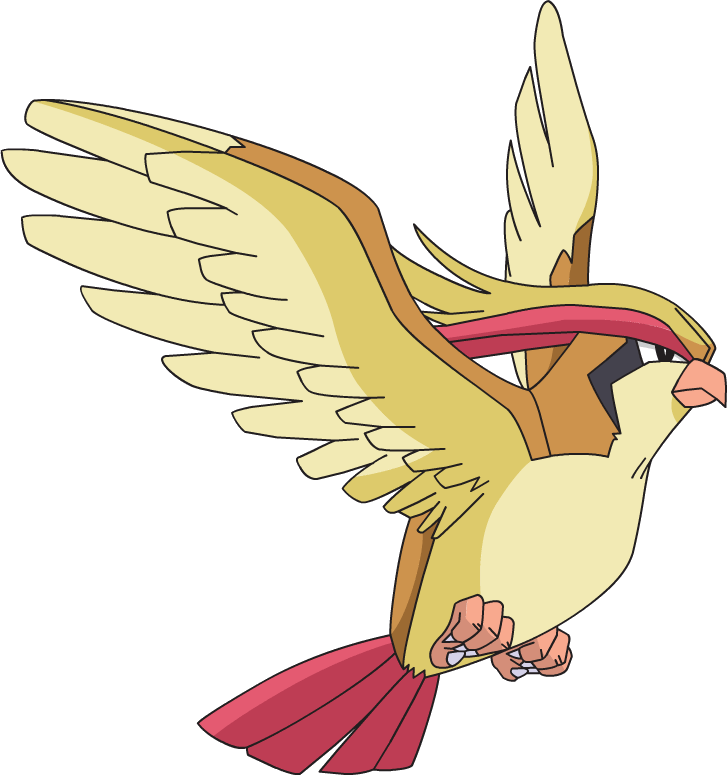 Pidgeot is an avian Pokémon with large wings, sharp talons, and a short, hooked beak. Its glossy plumage is mostly brown with cream-colored underparts and flight feathers. Its head is decorated crest that is nearly as long as its body. The center feathers of its crest are yellow, while the outer feathers are red. The fan-like feathers of its tail are red or brown. Its beak and legs are pink, and there three forward-facing toes and one backward-facing toe on each foot. Behind each eye is an angular black marking. Its powerful wings are capable of stirring up windstorms in just a few flaps, and it may spread its wings to intimidate enemies. This Pokémon is capable of flying faster than the speed of sound. Its plumage is often described as beautiful, making it a popular choice for skilled Trainers. Gust and Feather Dance are its former signature moves. Pidgeot typically dwells in forests with thick growth and large trees. It is known to prey on Magikarp, which it can spot from great heights. Ash Ketchum had a Pidgeot that he captured as a Pidgeotto early in his journey during Ash Catches a Pokémon. 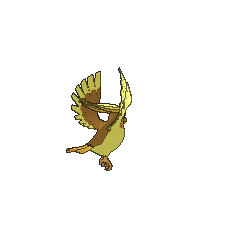 In Pallet Party Panic!, the same Spearow Ash had thrown a rock at in the first episode returned with its flock, but it had evolved into a Fearow. The flock attacked Ash, so Pidgeotto evolved into Pidgeot to battle Fearow. After Pidgeot defeated Fearow, Pidgeot left Ash's party to watch over a local flock of Pidgey and Pidgeotto. Ash promised to return for it someday, although this promise remains to be fulfilled. In Mewtwo Strikes Back, a Pidgeot owned by Corey was one of the Pokémon captured and cloned by Mewtwo. It was referred to as a Pidgeotto due to a dubbing error. The Pidgeot clone was seen again in Mewtwo Returns. In Bound for Trouble, wild Pidgeot that were twice their normal size appeared. Their size was due to there being excessive quantities of food on one of the Orange Islands. One of these oversized Pidgeot snatches up Meowth and Pikachu when they got tethered together. Falkner of the Violet City Gym owns a Pidgeot as his main Pokémon. He uses it in his Gym battle against Ash in Fighting Flyer with Fire, but it was defeated by his Charizard, giving Ash the Zephyr Badge. 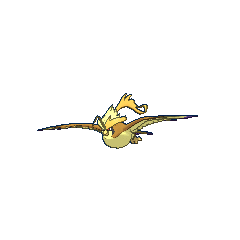 A Pidgeot owned by Solidad was used alongside Slowbro in a two-on-two Contest Battle against May's Combusken and Munchlax in the Kanto Grand Festival. A Pidgeot was owned by Sir Aaron in Lucario and the Mystery of Mew. Also, Mew transformed into a Pidgeot in the movie. One is used by Ben in Pokémon Ranger: Heatran Rescue!. A Pidgeot that can Mega Evolve appeared in Volcanion and the Mechanical Marvel, under the control of Dohga and Ether's Mega Wave. Pidgeot made its first appearance briefly in a fantasy in The School of Hard Knocks. A Pidgeot belonging to Rudy appeared in Misty Meets Her Match. 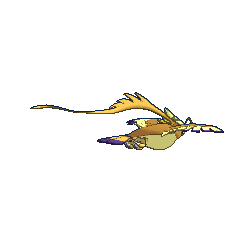 Multiple Pidgeot also appeared in The Power of One, Destiny Deoxys, Giratina and the Sky Warrior and Zoroark: Master of Illusions. A Pidgeot appeared in Beauty and the Breeder where it participated in a Pokémon breeding competition. Two Pidgeot made a brief appearance in The Legend of Thunder!. In Hoenn Alone, an Officer Jenny used a Pidgeot to help locate Ash's Pikachu after it was stolen by Team Rocket. In A Staravia is Born!, a wild Pidgeot helps Ash and his friends to rescue some Flying-type Pokémon from Team Rocket. In Riding the Winds of Change, Officer Jenny and Nurse Joy use many Pokémon, including a Pidgeot, to blow the Gligar away from the city. Pidgeot made a cameo in Arceus and the Jewel of Life. A Pidgeot that can Mega Evolve into Mega Pidgeot appeared in Mega Evolution Special II. 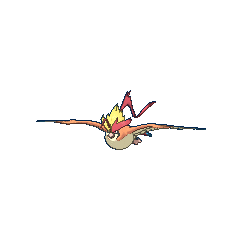 A Pidgeot appeared in SM003, as a silhouette. EP081 Pidgeot Ash's Pokédex Pidgeot, the Bird Pokémon. The evolved form of Pidgeotto. It can fly at twice the speed of sound at an altitude of nearly one mile. Blue used a Pidgeot during his battle with Red in File 4: Charizard. Blue owns a Pidgeot, which appeared in The Challenger. He used it during his Pokémon League battle against Bruno and his Machamp, where it eventually won, letting him progress to battle Agatha. Blue owns a Pidgeot that was one of the earliest members of his team which first appeared in A Tale of Ninetales. In the Yellow chapter, it delivered mail from Blue to Professor Oak and vice versa. It now resides in the Viridian Gym as one of its defenders in case of challengers appearing while he is away, with Blue's Rhydon taking its place in his active team. Professor Oak, in his disguise as "Dr. O," is also seen with a Pidgeot in Just a Spearow Carrier. In Can You Diglett? a Pidgeot as a silhouette when Agatha and Lorelei explains to Red about how Pokémon and people can't coexist with each other. Crystal mentioned that she captured a Pidgeot on her way to Professor Elm's Lab in Three Cheers for Chikorita. 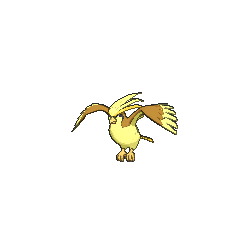 A Pidgeot was one of the Pokémon sent to help the fight in Ilex Forest in The Last Battle XIII. Shigeru used a Pidgeot to attack Satoshi while he was flying on his Charizard. Gary has a Pidgeot and used it along with his other Pokémon to battle the giant Slowpoke in Ash vs. Gary. Falkner's Pidgeot debuted in Falkner The Bird Keeper's Challenge!!. It went up against Gold's Totodile and lost. This Pokémon flies at Mach 2 speed, seeking prey. Its large talons are feared as wicked weapons. Capable of flying incredibly quickly. In full flight, by the time its flapping is heard, it is long gone. Its outstanding vision allows it to spot splashing Magikarp, even while flying at 3,300 feet. Moves marked with a superscript game abbreviation can only be bred onto Pidgeot in that game. 51%-100% HP Let my mach-2 speed set the pace! 26%-50% HP My HP's been shaved to half. Level up That's it! I leveled! My momentum will knock foes down! Erases Pokémon in a horizontal V-shaped pattern. 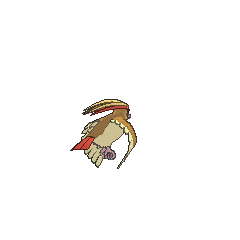 For other sprites and images, please see Pidgeot images on the Bulbagarden Archives. 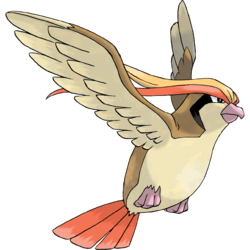 Pidgeot originally had an extra "t" in its name, but it was dropped. 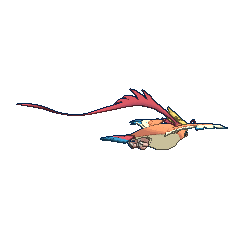 Pidgeot is depicted with red and yellow tail feathers in its official Generation I artwork, while the Generation III artwork depicts red ones only. This discrepancy is expressed in numerous ways in Pidgeot's in-game sprites and anime depictions. When rebattling Gym Leaders in HeartGold and SoulSilver, both Falkner and Blue have a Pidgeot as their highest-leveled Pokémon. Coincidentally, Falkner is the first Gym Leader while Blue is the last. Despite its name, its appearance and behavior do not resemble a pigeon so much as that of a bird of prey, specifically true eagles. In particular, its Shiny coloration resembles a Golden Eagle. Pidgeot and Pigeot are combinations of pigeon and jet (referring to its great speeds). Cantonese Chinese ??? Daaihbeihníuh In relation to the name of its pre-evolved form (??? ), this name literally means "Big Pidgeotto"